Don’t stick to the rivers and lakes that you're used to. Everyone loves a waterfall, but how often do you actually see one in real life? Waterfalls aren't unicorns, folks, they actually exist — and there are at least six great ones to gawk at within easy reach of Perth. 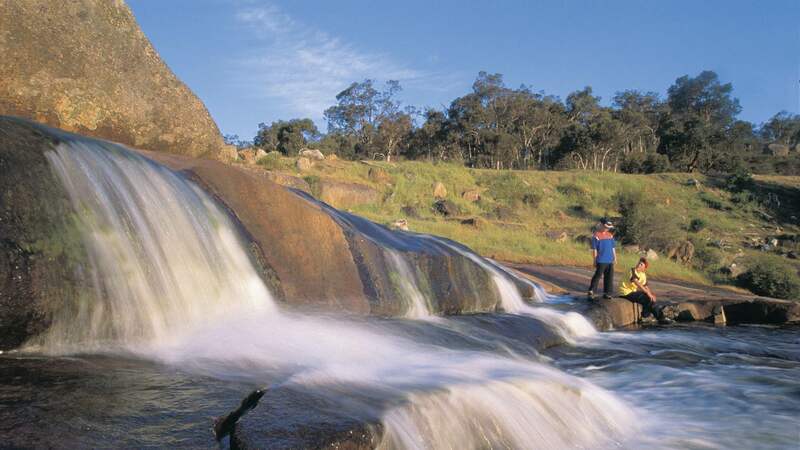 These falls are an oasis at the end of a trek through WA bush, where you can either dive into wild waters, dip your feet or stand in the spray of a roaring giant. Here's where to go chasing 'em. A note: set out with care. Waterfall areas are slippery, wild, untamed and unpredictable, so you'll want to keep your wits about you, particularly if you go swimming. Now on with the adventure. 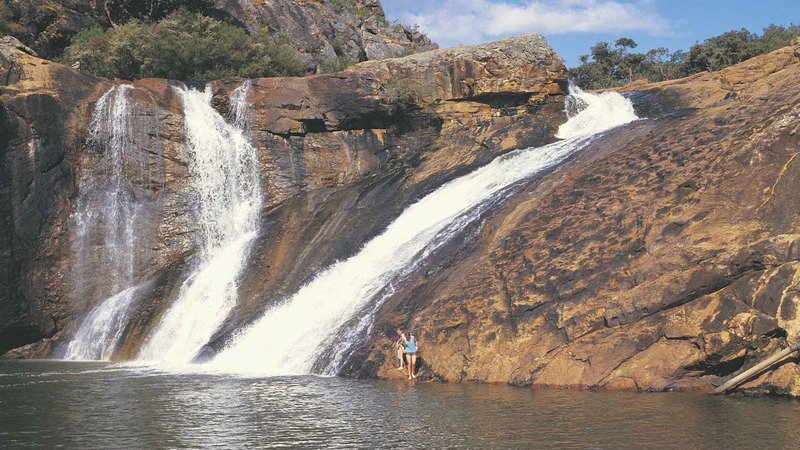 A hot spot just an hour's drive southeast of Perth, Serpentine Falls is one of the most stunning waterfalls in WA, and the best swimming option. With rock ledges to help you kick back and relax in the sunshine and an ever-flowing 15-metre waterfall for you to sit underneath, you'll feel as though you've packed up and left Perth for the weekend. When you get restless, take a short hike up the track to Baldwin's Bluff for the most epic views of the falls and the valley surrounds. Make sure you keep an eye out for kangaroos, as they tend to get pretty hungry up there. Hot tip: With summertime being peak period, the rangers tend to close the gates once maximum capacity has been reached, so it's recommended you arrive before 11am. 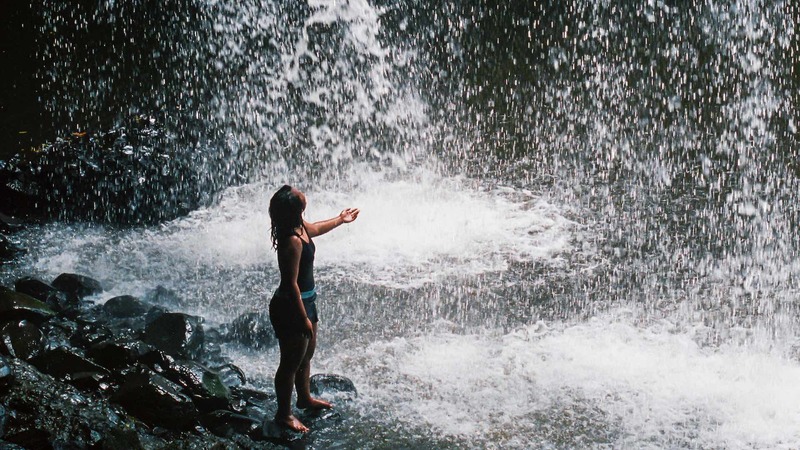 The 15-kilometre Eagle View loop trail may sound like a whole lot of kilometres, but when you get double the waterfalls for your walk, we can guarantee it'll be so worth it. At one end you'll pass National Park Falls, a waterfall that tumbles over several large boulders and boasts views over Jane Brook and beyond. 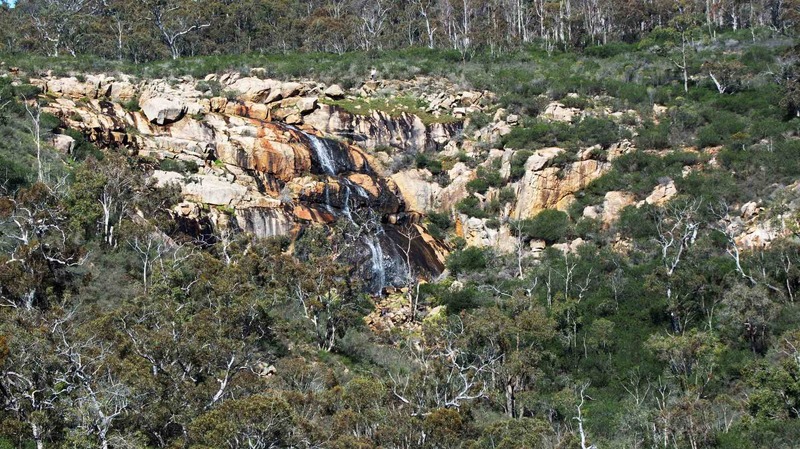 At the other end, you'll stumble upon Hovea Falls. Here you'll find a low, sliding-type waterfall, traversing over a large granite outcrop and pretty as a picture. Both waterfalls make excellent lunching areas, so be sure to pack a picnic. Swimming doesn't appear to be permitted, but paddling is okay. 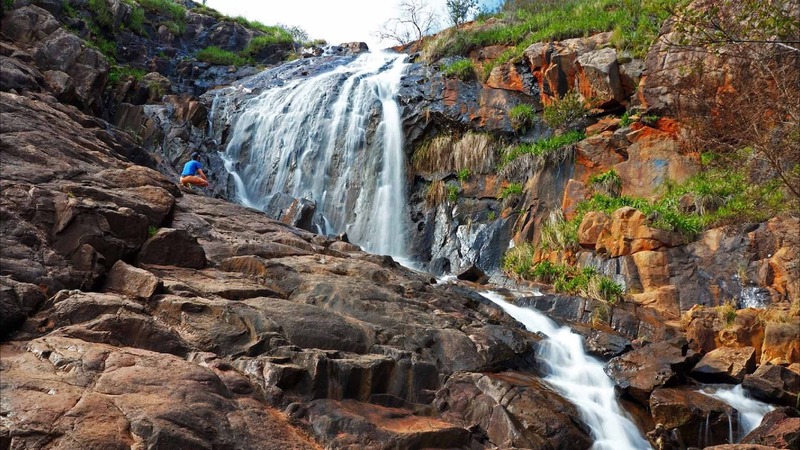 A quick 30 minutes from the city, Lesmurdie Falls is one of Perth's most renowned natural sites. And with a 50-metre waterfall, we can understand why. Begin your journey on the Lesmurdie Falls Walk by heading to a lookout, where you'll get one of the most bewildering views over the Swan Coastal Plain. Then, follow the trail down the hillside to the base of the falls where — if you're feeling up to it — you can reach your hand out to touch the waterfall as it runs down the rock face. We should mention that this particular waterfall tends to dry up over the hot summer, so it's recommended you check it out in spring when the falls will be flushed with winter rainfall. 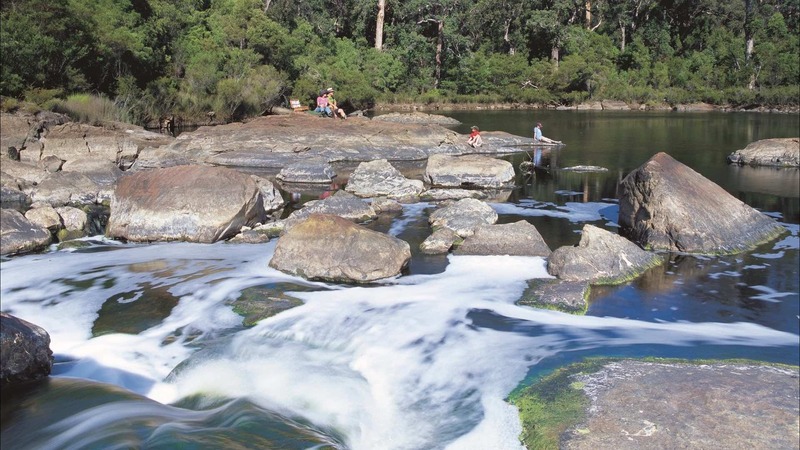 Nestled in a bush setting near the Gidgegannup township, Noble Falls is the kind of waterfall walk you can bring your four-legged friend along to. The trail is just under four kilometres and begins in the parking area, where you'll cop a sneak peek of the low, wide cascades. If you're up for some bird watching, follow the trail to Wooroloo Brook, a nature reserve abundant with wildflowers and the feathered flocks who love them. While the flowers are in full bloom during spring, winter is also a good time to visit when this waterfall is at its full-flowing prime. Tucked away in Ellis Brook Valley Reserve, a short 45 minutes from Perth city, this waterfall is a bit of a hidden gem. The best way to view it is on the Sixty Foot Falls walk. 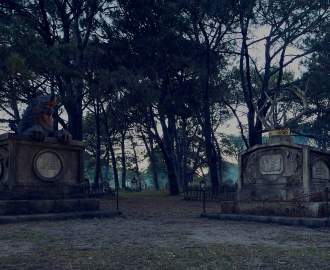 Taking you to the top of the waterfall, the walk is a short and steep two kilometres, but the views you get of the city and Swan Valley make it worth the spiked heart rate. The water is green, the cliffs are high and jagged, and the quarry is extremely surreal. The best time to experience the heavy torrent of this waterfall running over the brightly coloured rock face is after a few heavy rains, as it tends to be a little temperamental over the summer. Ok, so it's not exactly in close proximity to Perth and it's not technically a waterfall, but we couldn't not mention the Injidup Natural Spa. Next time you venture down south, head toward Yallingup and veer off Wyadup Road, following it right to the end. The crowded carpark is a dead giveaway that you've arrived. Take a short walk from the carpark to the large rock pool and prepare to be wowed. 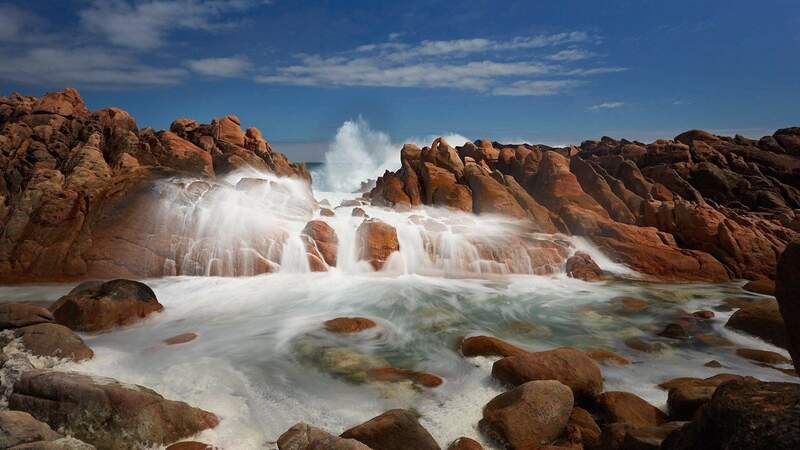 The natural rock pool receives ocean waves through a narrow 'rock alley', which causes the water to foam as it enters the pool, making you feel like you're in sitting in an ocean spa. Take your natural spa experience one step further and sit against the alley when the water comes in through the narrow way, and you'll feel as though someone's just cranked the spa jets. Be careful, and don't enter the pool if the ocean's rough — one massive wave could put an end to the fun.